Before I embark on writing some of my recollections of various cultural rituals that I grew up with, I think I have to explain a little as to how it all came about and, without delving too deeply into the intricacies or delicacies of religions, how we Chinese adopted such a colourful mixture of doctrines, beliefs, religions and philosophy. Feng Shui or Geomancy stemmed from the time when ancient Taoist sages devoted much of their time to “cultivating the Way” and meditation. Through their serene contemplation of nature’s working, they not only recognised that yin and yang exist in nature but that nature goes through a process which bears a resemblance to the interaction of the five elements, fire, earth, metal, water and wood. They also observed these sometimes conflicting forces at work and learned to predict the outcome or to manipulate them without tampering with their inherent properties. This is the art of “Wu Hsing” (the Five Phases) which is not so much elemental but as an active concept which implies “activities” and which plays a very important role in determining the temporal energies of a given situation. cut down the undergrowth. To ensure a comfortable life in the spirit world, paper items like shirts, trousers, watches, money, gold and silver ingots made from joss paper and sometimes luxuries like houses and boats were burnt as offerings to our ancestors. The day would end with everyone sharing the food at an enormous family meal with mah-jong to follow. spans the whole of the seventh lunar month where the spirits of the dead are to roam free in the realms of us mortals. Deceased kin return to the family home (where the family altar is housed) to feast on the offerings that are placed usually on the 1st and 15th day. harm the peasant should she defy him. She was so saddened by the Jade Emperor’s attitude and in order to save her loved one from harm, she consented to return to the realm of the immortals. She refused to go to the palace of the Jade Emperor but instead chose the moon as her place of abode. 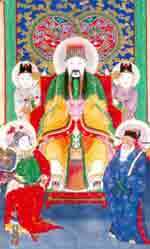 The Jade Emperor felt his deed was for the good of his daughter but was so saddened by his daughter’s self-imposed exile that he consented to her seeing the peasant once every year in mid-autumn. I think the Feng Shui people are obcessed with career, Rich, famous, getting power, Money and such while taoism is based on a simple life, not to involverade too much in politics, not to bow for the Rich and powerful, compassion for animals both wild and domesticated, I think it is the opposite.For me Lao Tse is the greatest chinese ever lived. Those Feng Shui people seems to love Money too much.